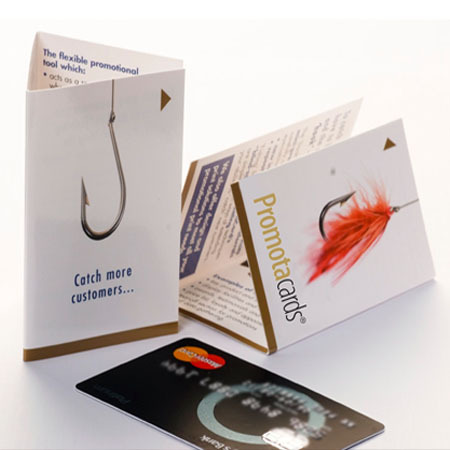 Promotacards make a lasting impression in seconds without you needing to say a word. They are designed for today's networked world and harness the power of 'word of mouth' more effectively. Promotacards are available in two flat formats; Double Business Card size(Portrait or Landscape) or Triple Business Card(Portrait). They are printed in Full Colour on both sides and supplied flat, creased ready to fold to their finished size of 85mm x 55mm at the point of use. They can be specified with Gloss or Matt coating to the face side. And for ultimate impact they can be Digitally Embossed.